Betty Edwards' five-day Drawing on the Right Side of the Brain® workshop is now available in the UK. The five-day pencil drawing course is taught by Anna Black, under license from Drawing on the Right Side of the Brain Inc. I am delighted to be offering a residential course option at an inspiring location in North Wales. (If you live locally it is possible to attend on a non-residential basis. Please contact me for details). The Drawing Portfolio (RRP over £55 exc DVD). This is yours to keep and includes all the materials you will need for the course, including drawing tools unique to Drawing on the Right Side of the Brain® , which were designed by Brian Bomeisler. The Drawing Portfolio was designed by Dr Edwards and Brian Bomeisler. To find out more or to book please get in touch here. If you have a non-drawing friend or partner who would like to attend with you this may be possible to arrange. Please contact me to discuss. You can also attend this course as a non-resident paying a day rate for lunch/tea & coffee. This is yours to keep and includes all the materials you will need for the course, including drawing tools unique to Drawing on the Right Side of the Brain®, which were designed by Brian Bomeisler. The Drawing Portfolio was designed by Dr Edwards and Brian Bomeisler. A non-refundable deposit is required to secure a place and the amount varies according to whether the course is residential or not. For non-residential courses booked within 6 weeks of the start date the full course fee is required to secure a place. For residential courses, the full fee and any accommodation costs must be paid in full 2 months before the start date. To take advantage of the Early Bird Discount you can pay a deposit to secure your place and then the balance of the course fee and accommodation must be received by the stipulated dated otherwise the full course fee of will be charged. If the Early Bird discount has not been used all fees for the course and accommodation (if applicable) must be received by the date specified on the Booking Form . There are no refunds after the full tuition has been charged. However, if a substitute is found for your place the fee less the non-refundable deposit of £80 will be refunded. We reserve the right to cancel a course due to insufficient numbers or other circumstances and in these instances participants will receive an option of transferring to a different course date or receiving a full refund. We can take no responsibility for any travel or other costs incurred so please make sure you have appropriate insurance. This drawing was done on Day 2. The student was someone without drawing experience before the course. 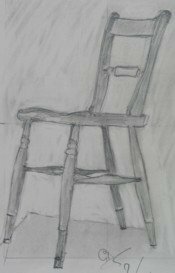 Return to Drawing Courses to follow links to read details of previous participants' experience of the course and see some course drawings.